Crystal Blue Persuasion. 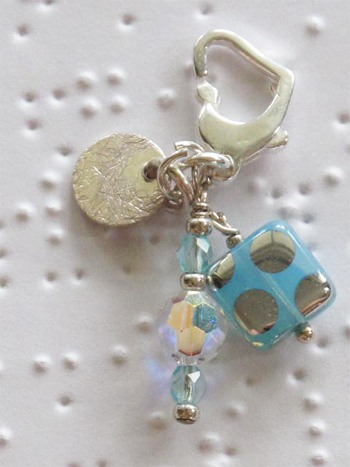 This chi charm simply evoked the title of an old song from another era. The polka dot bead is imported glass from one of the vendors at the Toronto Bead Society's semi-annual event - something I have missed now for the second year. Probably a good idea for me to start using up my rather impressive collection of beads, baubles and silver findings anyhow. Wishing you a creative day and week, and may we all be inspired by our collections of 'this and that'. Catching up on your posts, they always make me feel lite and put a smile on my face..Thanks!